Are you in the market to purchase a top of the line fishing boat at a great price? If so, Marine Connection has the perfect boat for you. 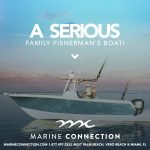 Marine Connection has been a reputable boat distributor since 1987. 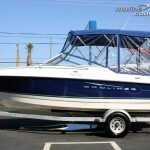 Recently, a used, 1998 Bayliner Trophy 2352 has come into possession and is on the market. Lucky for you, these boats are worth every penny. Bayliner Trophy boats are designed to provide fishing clientele with the affordability, flexibility and versatility desired in a fishing boat. One of the most popular boats exported to Europe and Australia, Bayliner Trophy boats are renowned in the fishing world for being ideal boats for all day, short-range fishing excursions. Avoid costly boat fees, these small-scale, light-weight fishing boats make towing and storing a breeze. 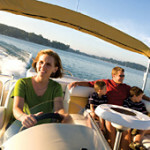 Enjoy a long day of fishing or a day of family fun on the water. Whatever your expectations may be, these boats are versatile and allow you to hit the water with ease. The Bayliner Trophy 2352 that Marine Connection has in stock is powered by innovatively designed, Mercury Twin 115HP offshore outboards. Other specs for this boat model include: a length of 23.5 feet, a beam 8.5 feet, a deadrise of 20 degrees, a weight of 4411 lbs., a rigged length of 25.5 feet, a draft hull of 1’8.3″, a draft max of 3’1″, a fuel capacity of 101 gallons and a water capacity of 8 gallons. There are several benefits to buying a used boat instead of a new one. 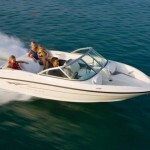 Like buying a car, the value of the boat decreases immediately after purchase. This being said, used boats are much more affordable than new ones. As an added benefit, you will already be purchasing the Bayliner Trophy, which is a reasonably priced boat from the start. Older models have often been reviewed by previous owners, so you know what you are getting. These are important details that must be taken into account when making large-scale purchases. Receive guidance on how to make educated boat purchases from Marine Connection. Feel confident and secure in your investment, by purchasing a boat from an international boat exporter and largest volume superstore in south Florida. Inventory includes everything from new to previously owned, bank repossessions, liquidations, factory distressed short sales, closeouts and trade-ins. You are sure to find the boat you seek. Following their philosophy since 1987, Marine Connection guarantees you will have a professional, boat purchasing experience. Satisfied customers agree, Bayliner Trophy boats are the most popular, small fishing boats in the world. If you buy your used Bayliner Trophy from Marine Connection, you will be offered competitive prices, with the ability to finance, that will leave you feeling satisfied with the value of your purchase. 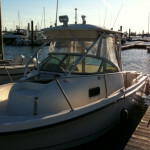 For more information on the used Bayliner Trophy boat or any other boat, visit www.marineconnection.com. The website has daily updated inventory lists, in-house financing information, and export/delivery details. Don’t waste another minute wishing for your dream boat. 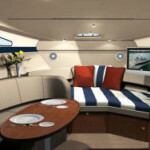 Contact Marine Connection, and let us help you make your dream come true!